Pollutants in the air, food and water we ingest can cause damage to our organs and tissues. It is important that we cleanse or 'strip' these poisonous toxins from our bodies regularly. 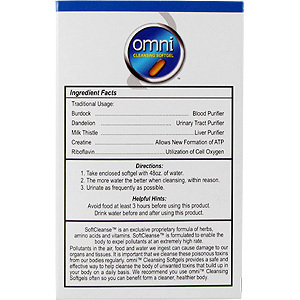 Omni™ Cleansing Softgels provide a safe and effective way to help cleanse the body of unwanted toxins that build up in your body on a daily basis. We recommend you use Omni™ Cleansing Softgels often so you can benefit from a cleaner, healthier body. Other Ingredients Soybean oil, gelatin, glycerin, beeswax, caramel, lecithin, titanium dioxide.Preservative and gluden free, no sugar, starch, artificial colors, artificial flavors, wheat, yeast or corn added. I have used this product at least 10 times in the past year. I am currently on probation and this stuff helps me pass my drug tests. I have used this for my last 2 job drug screenings. I have been meaning to quit but this stuff has really saved me and I was able to pass the test and luckily get the job. Couldn't be happier. 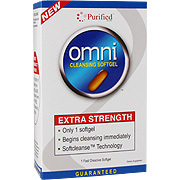 Omni Cleansing Softgel - is shipped in a discrete, unmarked package. Orders are processed immediately and usually take about 3 to 5 working days to be received. We do ask that you try it for 2 to 3 weeks to feel the full effects. Any information received is used only for order processing and shipping purposes. Your information, such as e-mail address, will never be disclosed to a third party.